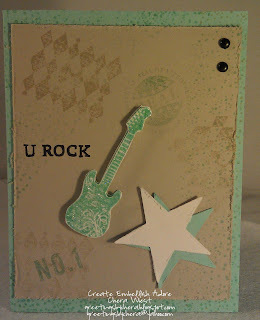 Create Embellish Adore: U ROCK! We have water! .... Its flooding like mad here in Central PA! We will NOT be attending the Washington DC festivities for the Nations Tri! ..and my daughters mold allegeries are in check (fingers crossed it remains)! So therefore I need a feeling of appreciation... like the world isn't crumbling around me... because its soggy enough that it definately feels that way!... So I put some scraps together...in the new cool Pool Party color! I paired the Pool Party with River Rock, using the Grunge Rock stamp set- gives it the edge that I wanted, plus, it was cut and laying on the table.. LOL. I will definately be taking this to another level but at the moment this helps make me feel better! sorry you are not able to go do the Nations Tri this weekend :-( I hope the weather lightens up for you all up there.